It's safe to say that JESEL is the originator of the modern racing belt drive system. 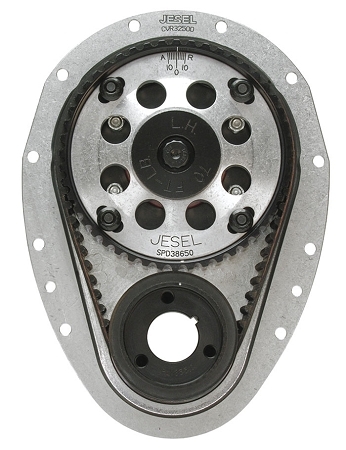 Like most JESEL valvetrain components its belt drive was born out of necessity as NASCAR racers were experiencing frequent timing chain failures in 500-mile races. It has been refined over the years to a precise timing system that is durable enough to endure tough 24-hour races such as Daytona and Le Mans or a full-season of circle track competition. Racers have been rewarded with years of service from their JESEL belt drives by simply replacing the belt at recommended service intervals. Besides being more durable than gear or chain drives, JESEL's belt drive systems offer a number of advantages. Cam timing adjustment is made externally providing the easiest and most accurate tuning available. Billet aluminum Spider is made from 2024-T6 and is available as a solid unit for additional strength. Accessories available to run distributor drives, fuel pumps or oil pumps off front of cam. Hard coated Billet aluminum 7075 Upper Pulley features patented High Torq Drive™ tooth configuration. Teflon® coated high vacuum cam and crank seals. Patented High Torq Drive™ reinforced belt operates dry and spins with less friction than timing chains or gear drives and also absorbs harmonics. Crank Pulley is heat-treated steel and incorporates a High Torq Drive™ tooth configuration. Kit hardware is all Grade 8 Allen and Torx™ head design. Every JESEL belt drive system is built using the finest materials and coatings available, and is machined to precise tolerances in JESEL's state-of-the-art CNC machining centers.